When World War I broke out in 1914, all the Germans in this corner of Australia were arrested and interned at Beagle Bay. They decided to build a durable church (cyclones, white ants and bush fires had destroyed the previous wooden ones). And they modelled it on a photograph of a country parish church in their homeland. Ninety thousand bricks were fashioned by hand and fired. Mortar was made from the ashes of burnt shells. 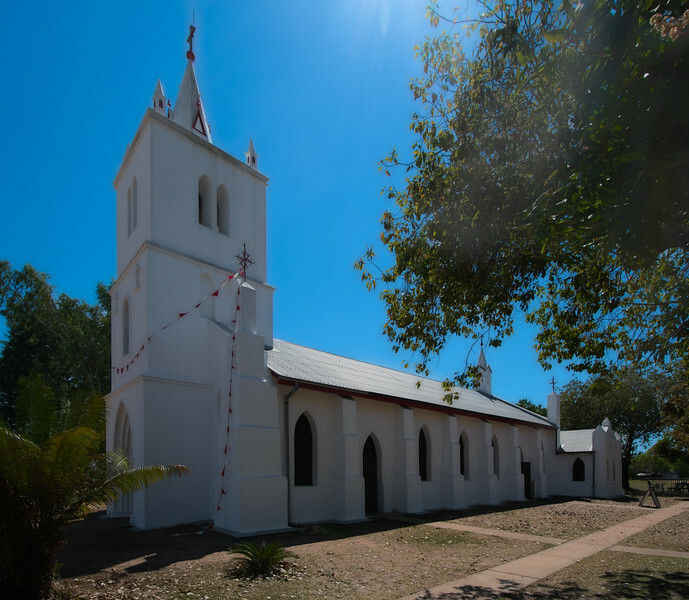 Once the building was completed in 1917, a team of Aboriginal women worked under the direction of a German priest to decorate the interior with mother of pearl, cowrie, volute and olive snail shells.